The usual array of appliances, furniture and automobiles (but certainly not luxury cruises this time) is being hawked in the name of Abraham Lincoln and wingman George Washington during America's annual Presidents' Day festivities. Lincoln's got it rougher, though. He's facing possible Oscar disappointment on Feb. 24th, with Argo now in a strong position to beat the once heavily favored Lincoln for Best Picture honors. And on the Sunday before that they're going to murder him again in Killing Lincoln, which also serves as National Geographic Channel's first original scripted drama. Adapted from the Bill O'Reilly/Martin Dugard bestseller, the film stars Billy Campbell in the title role and newcomer Jesse Johnson as his assassin, John Wilkes Booth. But on-camera narrator Tom Hanks seemingly gets as many words and screen time as either of them. He is, after all, Tom Hanks. The film premieres at 7 p.m. central Sunday and will be immediately repeated at 9 p.m. At times accompanied by music befitting a slasher flick, it plods along in the early going and never picks up enough steam to make it more than a passable diversion. Hanks is in part grim reaper, repeatedly intoning the amount of time that both Lincoln and Booth will still draw breath. "Abraham Lincoln has 13 days to live." "Abraham Lincoln has less than four days to live." "Abraham Lincoln has less than 15 hours to live." "John Wilkes Booth has less than 12 days to live." "John Wilkes Booth has less than six days to live." "John Wilkes Booth has only hours to live." And in these cases there are no magical time travel machines available to reconfigure history by removing a mystical medieval doo-dad from the clutches of Prince Ned the Nefarious. Because this isn't an ABC drama series. Hanks, who does his best under the circumstances, also is saddled with the line "That is Abraham Lincoln" when perhaps the most familiar historical figure ever is first introduced on camera. This hardly seems necessary -- unless you're convinced that Honey Boo Boo's mom will be watching. But in that case, no amount of historical exposition would be enough. Campbell, who got plugged as a politician on AMC's The Killing, is in a no-win situation when compared to Daniel Day Lewis' bravura big-screen performance as Lincoln. So let's just say he's OK and leave it at that. Johnson as Booth is instantly hammy. 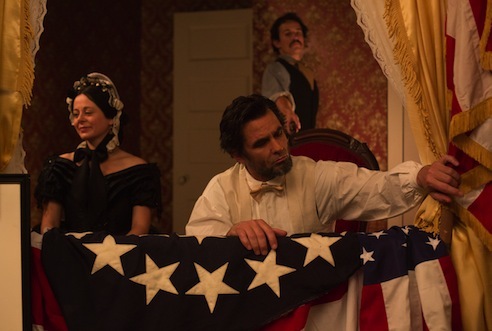 Lincoln's killer also was a stage actor, but this performance makes it seem as though all his world's a 24/7 stage. Which makes it hard to take from start to stop. Befitting the O'Reilly/Dugard book, National Geo's Killing Lincoln is filled with little historical asides that flesh out this larger than life tragedy. Hanks therefore is on constant duty, chipping in here, there and everywhere when not noting how long each man has to live. At one point he says, "And the stage is set for the most dramatic and resonant crime in American history." That's definitely debatable, given what happened to President John F. Kennedy on the streets of Dallas nearly 50 years ago. O'Reilly's companion bestseller, Killing Kennedy, also stands handily ready for adaptation. Supporting parts in Killing Lincoln, none of which amount to much on-screen, are played by Geraldine Hughes and Graham Beckel as Mary Todd Lincoln and Secretary of War Edwin Stanton. Unlike the big-screen Lincoln, this production cannot be accused of being rich in character development. It's much more a bare-bones recitation, with some interesting sidelights in the telling. National Geo at least now has its feet wet in the "Original Scripted Drama" arena. Network publicity materials proclaim Killing Lincoln as "an electrifying look at a shadowy scheme cultivated during the rapid-fire succession of closing Civil War events and a wrenching journey to understand a reviled 'madman'." Subtracting "electrifying" and "wrenching" to reflect the actual finished product.